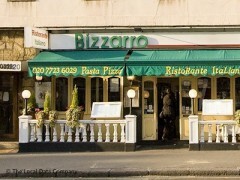 About: With its long terrace, Bizzarro serve a variety of authentic Italian dishes and can cater for private parties of up to 100 guests upon request. They also have a live band. Seating on the terrace area is provided, weather permitting. Excellent food and good service. I had the Gnocchi Napoli and it was delicious and my partner had the Spaghetti alla Carbonara which he said was very good. Our waiter seemed new since he was having trouble taking our order but the manager helped us out. I definitely will go back there on my future visits to London. Love this place and go every time we are in London. My husband is veggie and there is always loads of choice. Food is always fresh. They are very used to doing business lunches so they are fast and efficient. Brilliant. I stopped over in London on the way to Thailand, I stayed at a hotel near Paddington so decided to visit this resturant after seeing the menu outside. Food was medicore, beer was naff, but what really annoyed me was the waiter, the others seemed okay but this one particular one just thrust the card machine in my face, didnt say anything when presenting the food, it was the rudest service I've ever experienced in England. If you want to find out who, I ordered a lasange and a beer, 27 Aug, about 9pm, total £11. Unfortunately had a terrible evening as the food tasted microwave-esque i.e. not fresh, and the waiter service was very haste. The restaurant was hardly full but they acted as if they didn't want us to stay for long! We certainly feel we didn't get value for money. Don't think we will visit it again. We were enticed by the on-the-door service so decided to give this restaurant a try - what a terrible idea! The service was disappointing and, unfortunately, snobby, especially the 'look' we got from the waiter after deciding to just have tap water for drinks. Their bread tasted off and butter hard & frozen. We ordered air-dried cured beef for starters which was frozen. I had their traditional lasagne but it was not good - warm at best, and served with the blackened lasagne edges! I hope their kitchen is not one of Ramsey's kitchen nightmares. We had lunch for two there and had a fabulous meal. The garlic prawns were huge and flavoursome and I had a brilliant Steak cooked in a traditional mediaterranean style. The bread and the wine were 1st class as was the service. I went there recently for my dinner. The so-called 'fresh tomato soup' tasted as tomato paste, I have never tried tomato soup as bad as this. The seafood spagetti was okay. The bread was quite stale, so I guess they are putting it from the customers who didn't finish it to the new customers' bread busket for a whole day. The apple juice was from concentrate. The also put on my bill something I didn't have, and made the price for the seafood pasta £1 more than on the menu.